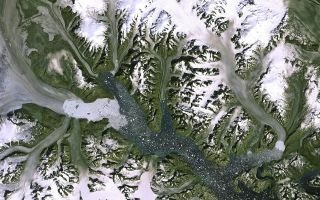 The Kangerdlugssuaq glacier and its ice stream are pictured in this week’s image, acquired on Sept. 19, 2012 by Landsat-7. The Kangerdlugssuaq glacier and its ice stream are pictured in this amazing space wallpaper, acquired on Sept. 19, 2012 by Landsat-7.It is the largest outlet glacier on Greenland’s east coast, discharging ice into the surrounding oceans. In this image we can see hundreds of icebergs speckling the water. A recent study based on satellite observations revealed that over the past 20 years the ice melting in Greenland and Antarctica has contributed about 11 mm to the global sea-level rise. This image clearly shows the glacier’s calving front, where ice breaks away. Over the years, satellite images have shown that this front has retreated – an indication that the glacier is getting smaller over time.